A News 5 investigation reveals that Cleveland's tobacco 21 law lacks obvious oversight with no indication of comprehensive enforcement. 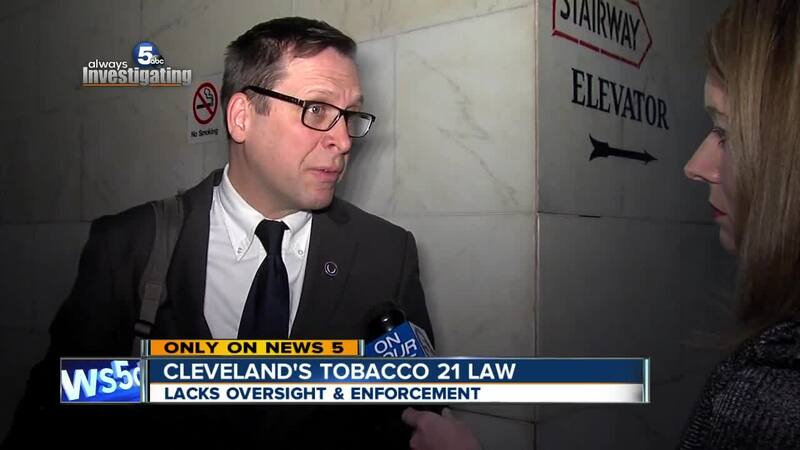 The law, which went into effect in April of 2016 after Cleveland City Council passed it four months prior, raises the minimum age to purchase tobacco products within the city limits from 18 to 21. Councilman Brian Cummins' health & human services committee led the charge in pushing through the law. Since it passed, it's been up to Cleveland police and the city's health department to enforce. We tried to talk police about enforcement of the law but they declined. Jennifer Ciaccia, a police spokeswoman, told News 5 in an email that "this [enforcement] is typically handled at the state level." But the state said that's not true. "I don't have the authority to enforce municipal codes or ordinances," said an undercover agent with the Ohio Investigative Unit. The agent said his unit does routine tobacco compliance checks at local businesses, and he and his colleagues can only enforce state laws. The state's tobacco law is 18, not 21. News 5 shared that information with Ciaccia who responded by saying officers respond to tobacco complaints. But when News 5 asked how often and whether the department has issued any citations, Ciaccia never responded. As part of the law, Cleveland retailers that sell tobacco are required to post a city-issued sign reminding customers that no one under the age of 21 can buy cigarettes, e-cigarettes, tobacco products and rolling papers. But when News 5 went looking for that sign, only one out of a dozen stores had it posted. The city's health department did not respond when asked if they do routine checks to ensure the sign is posted. They did say that they have not received any complaints regarding the sale of tobacco to minors since the law went into effect. "There are things like this that are on-going that we should be checking into," said Cummins. Cummins said he has not checked in with Cleveland police regarding enforcement of the law since it passed. "I know for a fact that we get complaints and the commanders get complaints with regards to this," he added. The penalty for violating the tobacco 21 law is 30 days imprisonment and/or $250 fine. A subsequent violation carries a penalty of 60 days imprisonment and/or $500 fine.